This is the last away shirt under Adidas era from the 1980s till 1990s. This shirt was used in season 1995-1996 only. It still retains the early 1990s main theme of green white colour combination, but in the form of alternate quarters. 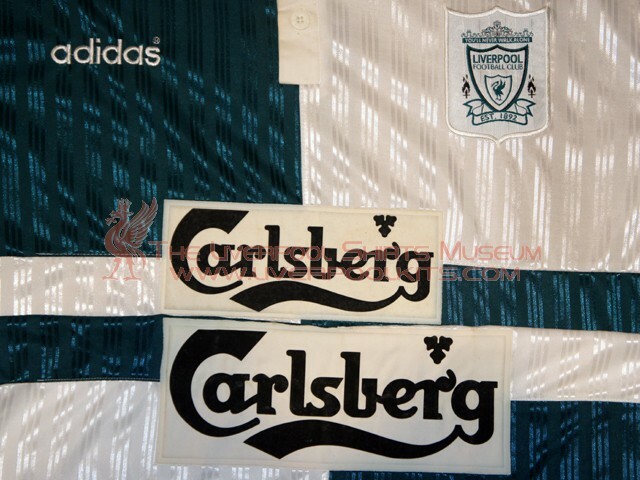 Typical player shirt of this style differs from replicas counterpart in having a smaller rectangular Carlsberg sponsor box. The UEFA Cup away player shirt has a smallest rectangular box on a comparative basis. Featured Liverpool players celebrating after goal scoring against Sparta Vladikavkaz in the 1995-1996 UEFA Cup 1st Round 1st Leg on 12 September 1995. 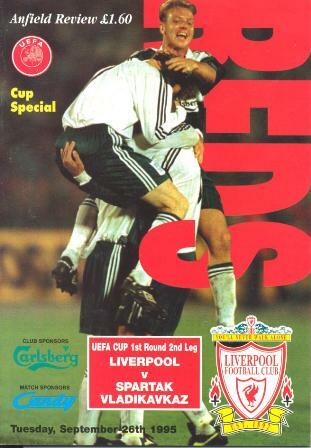 Home match program of Liverpool against Sparta Vladikavkaz in the 1995-1996 UEFA Cup 1st Round 2nd Leg. 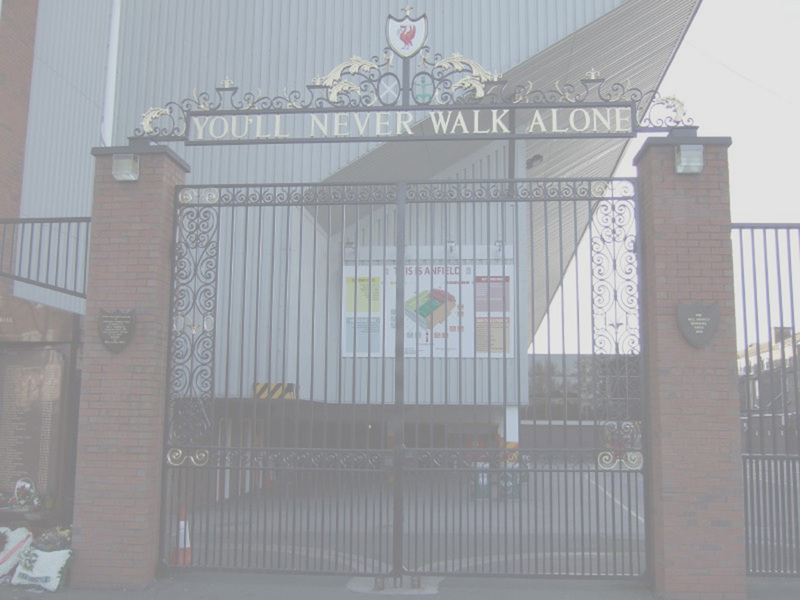 The cover shows the match action photo of the 1st Leg away match. 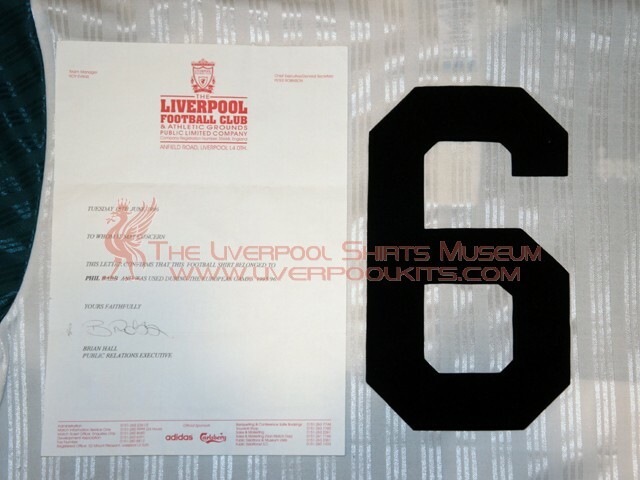 Featured "Razor" Neil Ruddock wearing the number 6 away shirt in the aforesaid match. Note that no player nameset was applied, and the number is a velveteen heat press instead of Adidas template. 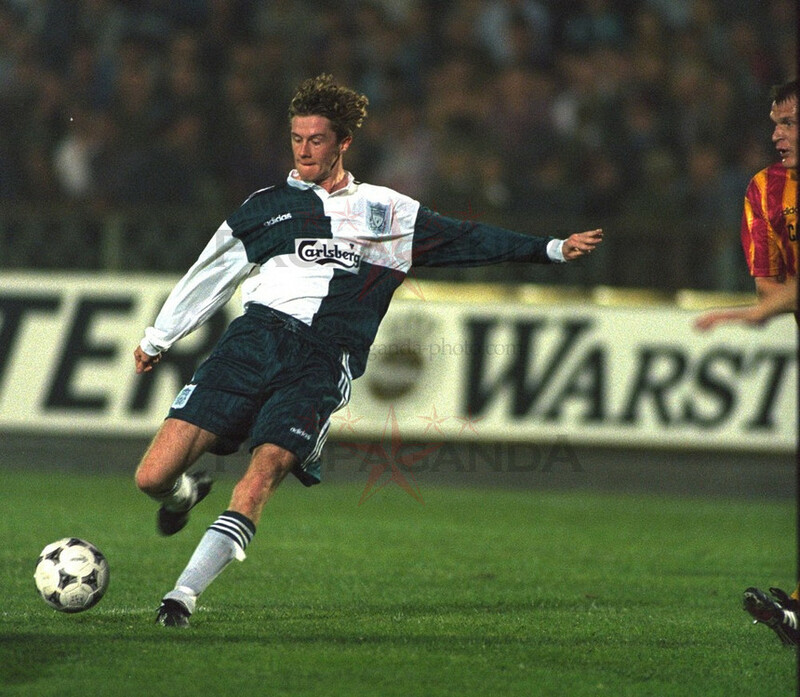 Featured Steve McManamann in match action in the UEFA Cup 1st Round 1st Away Leg. Seemingly the Carlsberg sponsor rectangular box looks smaller than domestic competition ones. 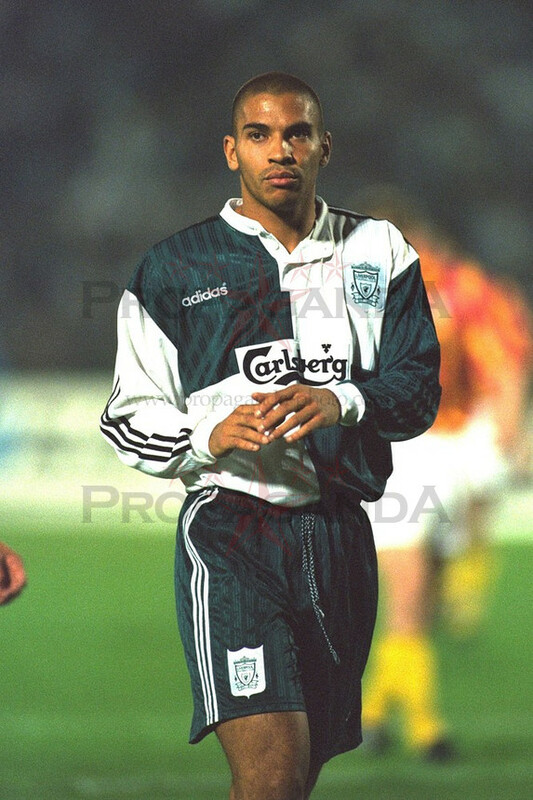 Featured Stan Collymore in match action in the UEFA Cup 1st Round 1st Away Leg. Seemingly the Carlsberg sponsor rectangular box looks smaller than domestic competition ones. 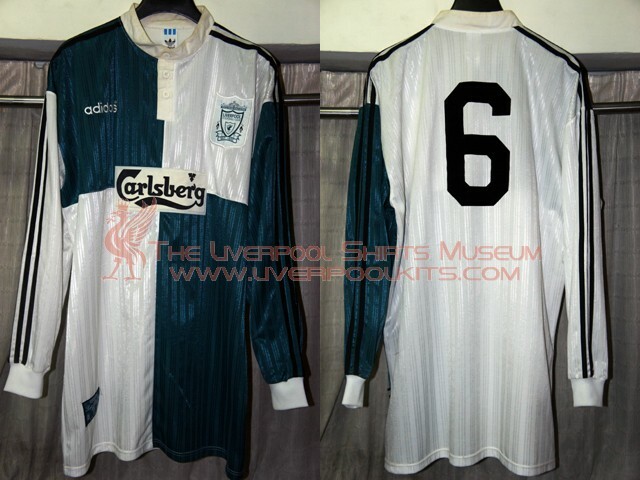 1995-1996 Liverpool UEFA Cup Away Player Shirt - According to the club letter of authencity, this number 6 shirt belonged to Phil Babb. On the contrary, match action photos show that a short sleeved number 6 shirt was worn by "Razor" Neil Ruddock. 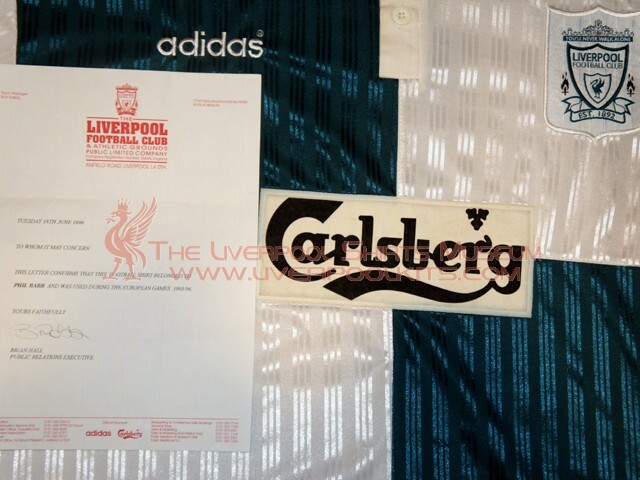 Here's the normal size difference of Carlsberg sponsor rectangular box between replicas (bottom) and player shirts for domestic matches (upper). 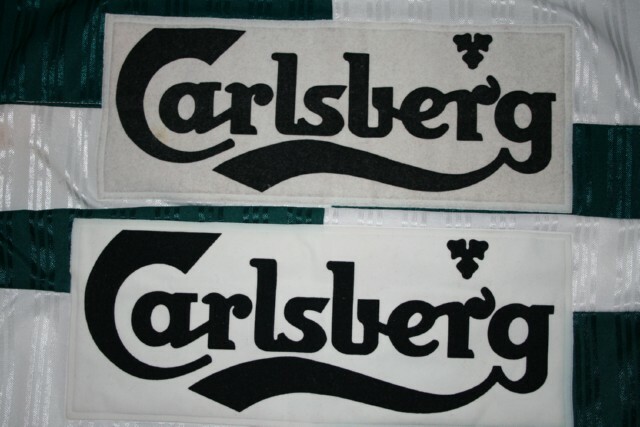 Due to UEFA restrictive rules on size of kit sponsorship logo in European competitions, the Carlsberg sponsor rectangular box on the UEFA Cup player shirt (upper) is much much smaller than the replicas (bottom). The shirt comes with a club letter of authenticity signed by ex-Reds Brian Hall, who was the Pubic Relations Executive then. The shirt was sald to be issued to Irish defender Phil Babb. UEFA ruling also limited the use of player nameset on the kit then. Thus, a velveteen black number was ironed on the reverse instead of the typical Adidas template nameset and number as found on typical 1995-1996 away shirts.